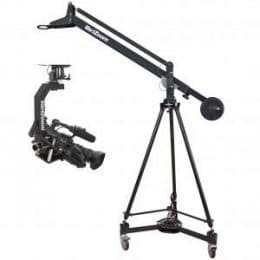 Camera cranes and jibs – VariZoom offers a large selection of professional camera cranes, video jibs, pan tilt remote heads and accessories. From compact lightweight jibs for confined spaces up to extended cranes for sweeping outdoor shots, VariZoom provides reliable, versatile designs to suit the needs of shooters at any level. Whether you are looking for a filmmaking crane, a sports video jib, or a camera crane for church and house of worship, VariZoom offers a wide range of turnkey solutions for all budgets. We have an extensive machine shop and a highly skilled team of engineers, technicians and long-term assembly squad to ensure consistent quality and quick resolution to any problems that might arise. 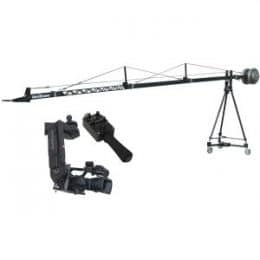 Every crane and jib is fully built up and functionally tested before it ships from VariZoom in Austin, TX, and with our full 2-year warranty you can buy from us with confidence. 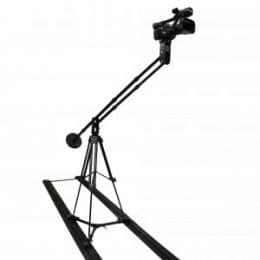 Our high quality jibs and camera cranes for sale give shooters many options, including an ever-growing line of accessories and the finest range of affordable remote pan tilt heads on the market. VariZoom cranes are built using stainless steel, machined aluminum, and precision fasteners for long-term durability and servicing. The QuickJib and SnapCrane are available in discounted kits with our range of Cinema Pro high-performance heads or the ultra-reliable MC100 or MC50 pan tilt heads. 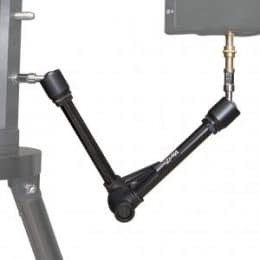 These camera cranes and jibs have been in production for many years and are available for direct purchase or through our worldwide dealer network.